“Islam and Modernity.” “Islamic Feminisms.” The titles of Professor Asma Afsaruddin’s Fall 2017 courses in SGIS’s Department of Near Eastern Languages and Cultures are intended to be provocative, she admits. 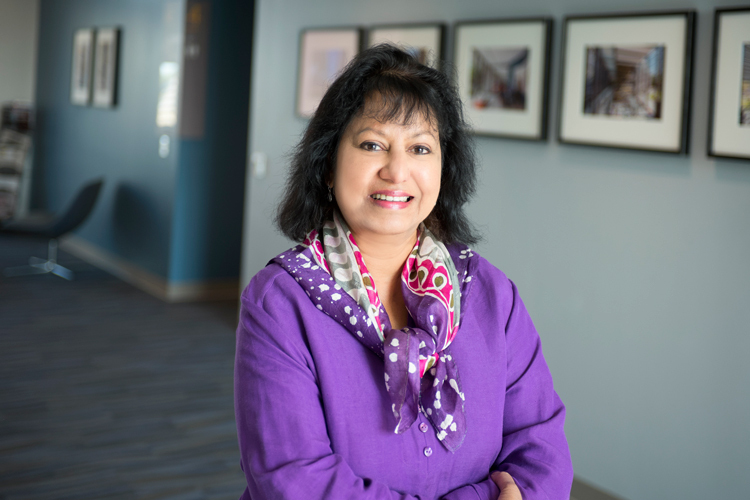 “I picked the titles partly for the shock effect.” As an academic and public intellectual, Afsaruddin has dedicated her career to improving the general understanding of Muslims, but acknowledges that juxtaposing the words “feminisms” or “modernity” with “Islam” still strikes a jarring note on an American campus in 2017. Once she’s gotten students’ attention, she hopes her classes will help them appreciate the heterogeneity of the Muslim world. “We do a disservice to the great diversity that we find in Muslim-majority societies by reducing the Islamic tradition to a monolithic phenomenon,” explains Afsaruddin, whose book "Striving in the Path of God: Jihad and Martyrdom in Islamic Thought" (Oxford University Press, 2013) sought to expand and nuance the concept of jihad. In 2015, the book was recognized as the best new book in Islamic studies with Iran’s Jayezeh Jahani, or World Book Prize, and was a runner-up for the British-Kuwaiti Friendship Society book prize. In Saudi Arabia, for example, there is what Afsaruddin calls a “vibrant women’s movement” that is working to repeal such measures as the injunction against women driving. The 2016 elections ushered more women into Iran’s parliament than there had been since the 1979 revolution. And in Indonesia, a prominent female reformer is working with clerics to draft more progressive interpretations of the law as it applies to women. Using the Quran to justify strictures that are repressive of women is a function of an increasingly powerful patriarchy, Afsaruddin explains. “Most of the interpreters since the first century of Islam have been men.” As such, interpretations of scripture reflected culturally specific attitudes and beliefs that were “masculinist – even misogynist,” but not rooted in the original language of the Quran. Certain customs that are ostensibly rooted in scripture were in fact sociologically driven, she points out. The custom of covering one’s hair, for example, is not stipulated in the Quran, but emerged out of contact with Byzantine and Persian societies, in which the seclusion and veiling of women was a marker of upper class affiliation. High-born Muslim women, Afsaruddin explains, adopted the custom by the eighth or ninth century as a way of indicating higher social status, and women of humbler origins imitated them in turn. Afsaruddin, who joined IU in 2009 after serving on the faculties of Harvard and Notre Dame, is optimistic about students’ desire to go beyond the headlines when it comes to the Middle East. “I think students realize they need to know more about that part of the world to be an informed person,” she finds.